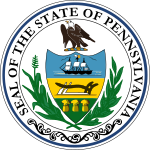 The Pennsylvania lieutenant gubernatorial election of 2010 was held on November 2, 2010. The winning candidates for Governor and Lieutenant Governor will serve a four-year term from 2011 to 2015. In Pennsylvania, the Lieutenant Governor is elected on the same ticket as the Governor, so the only campaign for this office was the primary election. As a result of Tom Corbett's election to the position of governor, Jim Cawley became the new Lieutenant Governor. As a result of the Democratic primary, Scott Conklin served as the running mate to Democratic gubernatorial candidate Dan Onorato. As a result of the Republican primary, Jim Cawley served as the running mate to Republican gubernatorial candidate Tom Corbett. ^ "2010 Pennsylvania Midterm Election". ^ Kristie, Dan (February 16, 2010). "Aichele ends bid for lieutenant governor". The Daily Local News. Archived from the original on January 21, 2013. Retrieved November 23, 2011.